What a great experience being at the Quilt Expo! The Quilt Show downstairs was amazing but I didn’t really get lots of time to look at it because we were so busy on our stall. Karen and Meredith from Somerset Patchwork were fantastic and a big help to me but most of all the response from all of you was wonderful. It was really encouraging to know so many of you out there shared my dream and thought the idea of a Quilters Retreat was a good one……..so thanks for the encouragment. My husband and his father are up in Lancefield this week working to make sure the place is ready for our opening in June. The next thing is to paint the outside of the cottage and the studio and we are thinking of cream and white but if anyone has ideas on specific colors then we would welcome them……. 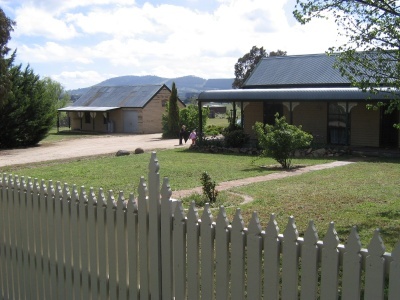 This is a photo from the front fence looking towards the cottage and studio with the Macedon Ranges in the background. 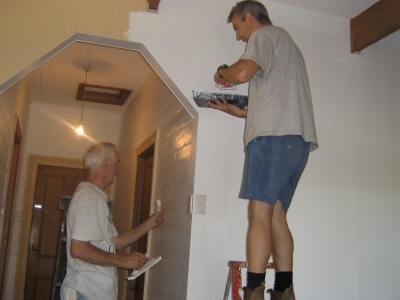 My husband and father-in-law painting inside the cottage during the Christmas holidays. Front bedroom after painting (but before decorating!) 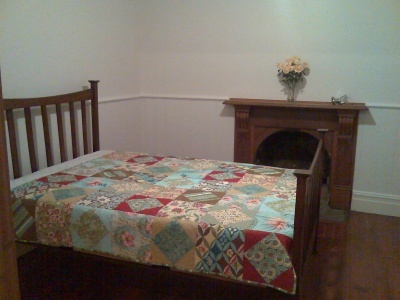 with one of my Amy Butler quilts on the bed. It’s hard to believe but a dream we have had for a couple of years is starting to take shape. We are in the middle of renovating a property in Lancefield, Victoria to become Sewjourn , a place to relax, create and enjoy! There’s a 4 bedroom cottage (sleeps up to 10 people) and a studio set on one acre right in the centre of Lancefield, a quiet country town, one hours drive north of Melbourne. We first discovered this property way back in September but it’s taken months for permits etc to come through and finally last week we had the OK in writing. So it’s been a busy couple of weeks finalising the name and getting business cards printed, building the website and now starting a blog. I’ve loved looking at ‘crafty blogs’ for over a year now so it’s exciting to finally be writing my own. Today was our first attempt at marketing Sewjourn to the wider public when I went to the Quilt Show and thank-you to everyone who was so positive and encouraging! A big thank-you to Karen Styles from Somerset Patchwork and Quilting in Mt Waverley for allowing me to be on her stall to talk to you all. So please visit our blog over the next couple of months and follow our progress as we creep closer to our opening in June……..hopefully there will be a few quilting projects and bits about life thrown in as well. You are currently browsing the Sewjourn weblog archives for February, 2008.